Iceland's Volcanic Heat Within Earth Melting Glacier. What Say You Al Gore? Eyjafjallajökull erupts, causing extensive flooding. Geologists who flew over Eyjafjallajökull glacier said a deep fault trough has occurred around the crater below the summit of the glacier. The gap measures about 500 meters, a report said. 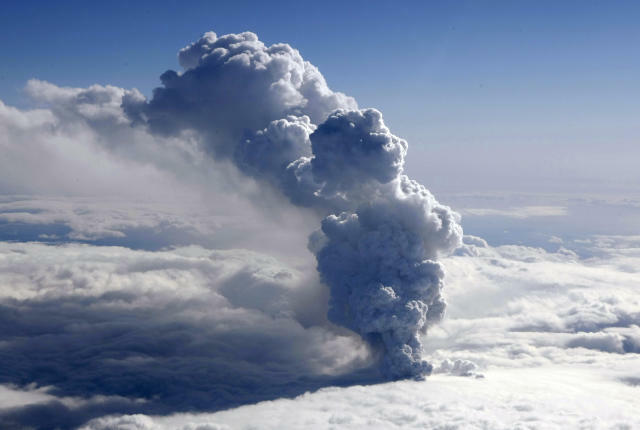 However, the geologists were unable to detect any vents or signs of eruption due to the cloud cover. The eruption which occurred in the top crater, buried about 200m beneath the ice, ejected a large plume of volcanic ash that reached a height of about 6,700m (22,000 feet) and there was ash fall to the east of Fimmvörduháls. The glacial river has flooded at a rate of about 1,000 cubic meters per second, a report said. Hydrothermal hot springs on the seafloor were also far more abundant than predicted. "We expected this to be a hydrothermally dead ridge, and almost every time our water measurement instrument came up, they showed evidence of hydrothermal activity, and once we even 'saw' an active hot spring on the sea floor," noted Jonathan Snow. The biologists on the expedition theorize that Arctic hydrothermal vent communities have been cut off from the rest of the worlds oceans for long periods of time, and may have conserved archaic forms.The central region without magmatic activity is unique in the worlds mid-ocean ridges, having no volcanic crust whatsoever. Here, scientists can directly sample rocks belonging to the Earths upper mantle, which is covered on every other part of the globe by thousands of meters of crustal rocks. Some of these mantle rocks were unusually well preserved, "I just about fell off my chair the first time I saw them in the microscope," says Jonathan Snow, "some of these samples looked just as if they had been brought right from the upper mantle by magic, not even a trace of alteration by seawater."